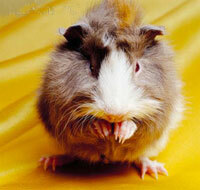 It is good if you watch out for distress in your Guinea pigs. Some noises, which include high pitched ones that we (humans) can't hear, can effect them. These noises could be a computer, telephone or even a mobile. If such things are effecting your pet move their housing away from the noise source. Copyright © Guinea Pigs Club.